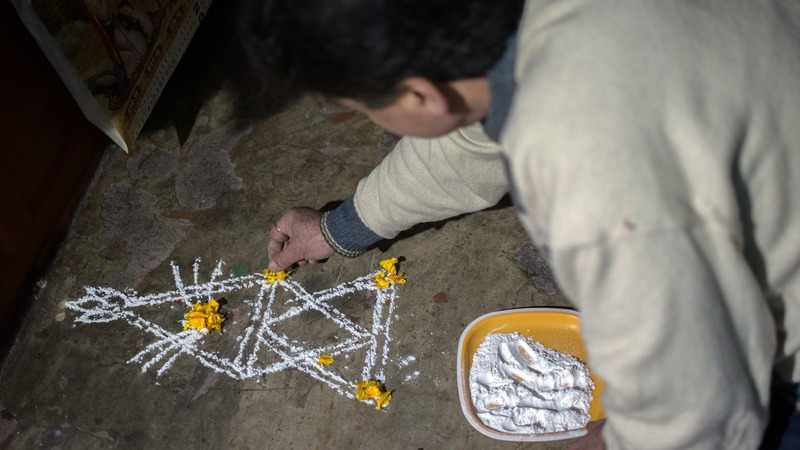 In the narrow lanes of Ganpatyar, Downtown Srinagar, the family of Rattan Chaku makes arrangement for the Herath Puja, pronounced Puza in Kashmiri. Sitting in a 250-year-old house, the patriarch of the family, Chaku, engages in dialogue while decorating the small spot next to kitchen, for prayer with necessary items like flowers, thrones, lamps, vase, incense sticks, vermilion etc. Herath or Heahrath is a Kashmiri Hindu festival, celebrated annually to honour the Hindu deity Shiva. The festival also marks the change in weather patterns, and an onset of rains that bring life to the dead winter earth. Chaku’s wife brings a bowl of hot Ghee which he pours in the lamps to enlighten them. ALSO READ: The Kashmiri Pandit’s Dilemma: To come back or not? “Since forever. There has been zero movement in our family. We have neither migrated from anywhere, nor we have thought about migrating to any place from here,” Chaku enlightens, while tying a red thread around a steel vase decorated with flowers and orange vermilion. “There was a time when no one was allowed in the prayer room. Even during my grandfather and father’s times, we were not allowed to sit next to them during prayers. But now times are changing,” informs Chaku, the general secretary of Kahmiri Pandit Sangarsh Samiti. “The puja goes on till four past midnight. It is a long process,” are Chaku’s final words, before he immerses himself in devotion, starting the Kalash puja, the preliminary prayer to the drawn vase on the floor before the main worship of the Lord Shiva. Chaku pours water in one of the vases filled with walnuts. The vase called Kalash symbolizes abundance. and is kept filled with water, fruits or coins. Chaku decorates the floor with flowers. Often the vases are decorated with coconut and its leaves. Chaku ties a vase with sacred vermilion thread. 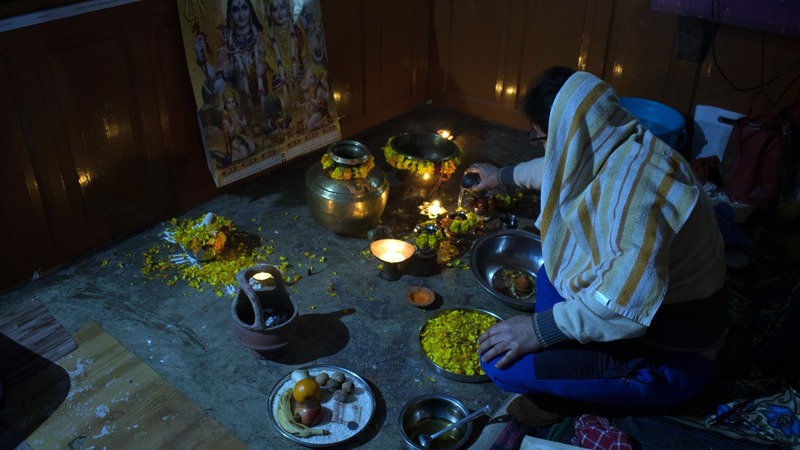 The Puja of the Kalah, also known as Kalash Puja, is a prayer done in many Hindu festivals, as the pot is considered auspicious and the bearer of abundance and fertility. All Photos have been taken by Furqan Khurshid.